Very often in landscape photography you get the landscape or the lighting you want, but not the sky. In the perfect world you’d keep going back again and again until everything was perfect. In our not-so-perfect-world, however, it’s sometimes useful to be able to add a new sky later, as the final touch to an image that was already 90% of the way there. The trouble with adding skies is that it’s tricky. Real-world scenes hardly ever have perfectly straight, uninterrupted horizon lines. Very often there are objects jutting up into the sky that complicate things. The traditional advice is to use the magic wand tool, Selection Brush or some other gadget to select the unwanted sky, and nothing else, and then drop in the new sky. Now maybe it’s just me, but that just doesn’t seem to work out too well. First, these selection tools always seem to leave a nasty little edge around objects against the sky. It’s a by-product of the way digital images are processed and sharpened that you get these tiny little edge halos which are invisible in the original image but highlighted by selection tools – basically, because they don’t select them properly. You can fiddle around for ages with selection refinement tools and eventually achieve a decent result, but that still leaves you with a second problem – ‘real’ skies have a natural graduation towards the horizon, whereas ‘pasted-in’ skies really do look like they’ve just been pasted in. So I tend to take a different approach which gets around both of these problems very successfully for quite a lot of landscape subjects. 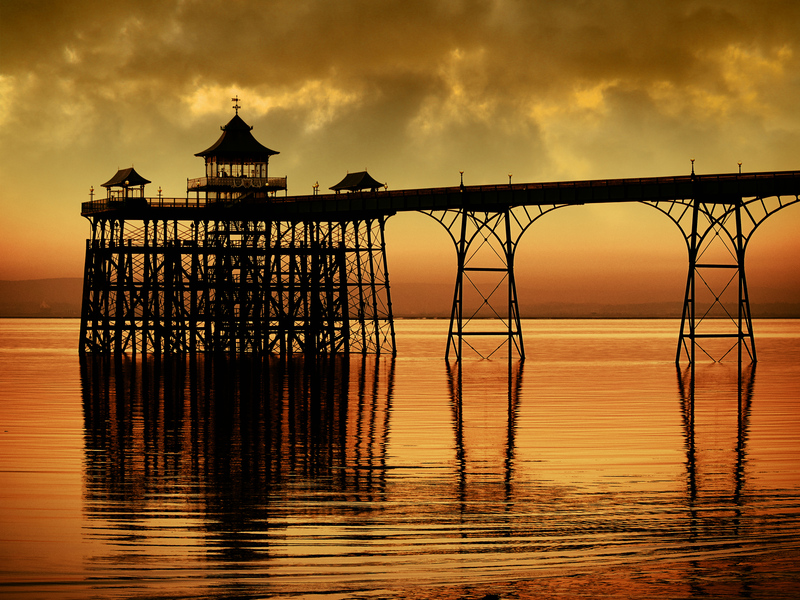 And to show how it works, I’m starting with this shot of a seaside pier at sunset. The colours are good, the composition is good, but the sky is empty and lacks interest. My method uses no selections, only a simple gradient mask and the right layer blend mode. There are a couple of other adjustments I make here, but they’re just to tidy up the result and not connected with the main technique – which is to make your photo-editing software do the work so that you don’t have to. 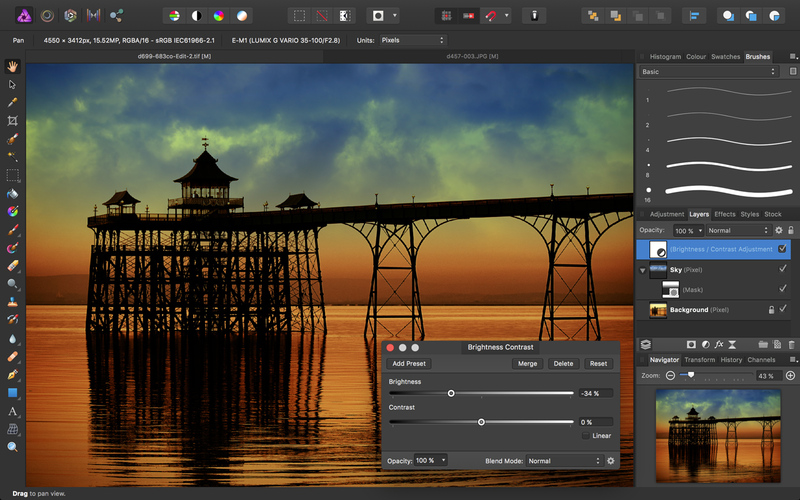 I’m working on this image in Serif Affinity Photo, but the same principles can be applied in any photo editor that supports layers, blend modes and masks, including Photoshop, Photoshop Elements, ON1 Photo RAW and Skylum Luminar. 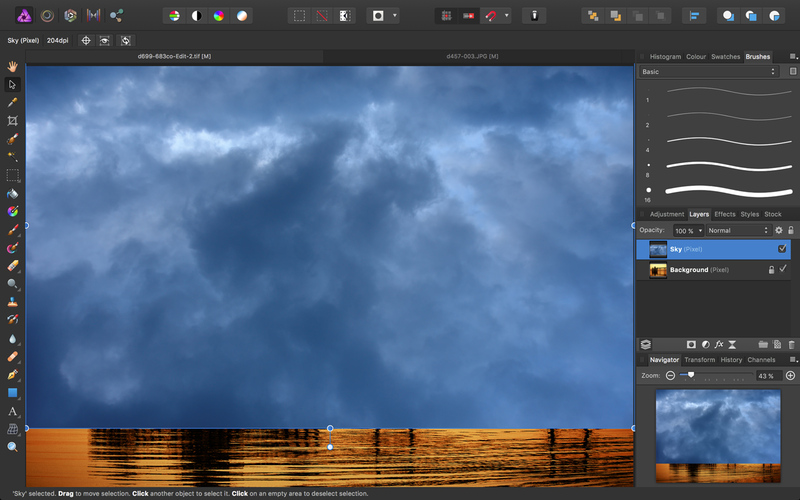 So here I’ve added my new sky as a new layer in Affinity Photo. I keep a stock of ‘sky’ photos handy for situations like these. This sky was shot on a 10-megapixel camera and I’ve added it to a photo taken on a camera with 16 megapixels, but it’s a simple matter to resize the ‘sky’ layer so that it covers the one below. It doesn’t reach all the way to the bottom of the picture, but it doesn’t need to, as we’ll see shortly. In the real world, skies change in tone towards the horizon. It’s what we expect to see. And we can make use of this to make our new ‘sky’ blend in with the image more realistically. All we need for this is a gradient mask applied to the sky layer. The exact menu commands vary from one program to another, but the principle is the same. In Affinity Photo I’ve added a mask to the ‘sky’ layer and then used the gradient tool to drag out a black-to-white gradient on the mask. This blends in the new sky progressively, from mid-way up the sky to just above the horizon line. Immediately, this makes our new sky look like it could really be part of the original scene. 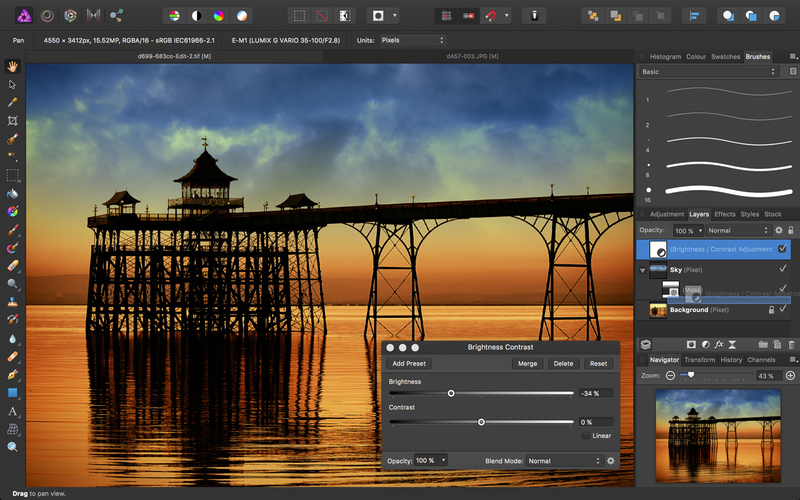 In this instance the colours need a few tweaks, and that comes next, but in principle these two tricks – the blend mode and the gradient mask – are the essence of quick and realistic sky replacements. In the old days of image-editors you’d make adjustments directly to the pixels on a layer, so this step would be more straightforward. 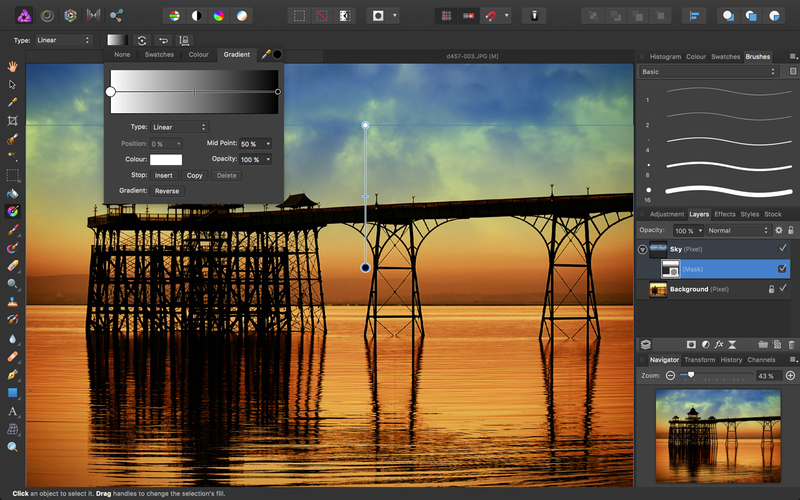 Affinity Photo, however, applies adjustments on non-destructive ‘adjustment layers’ which affect the appearance of all the layers underneath. 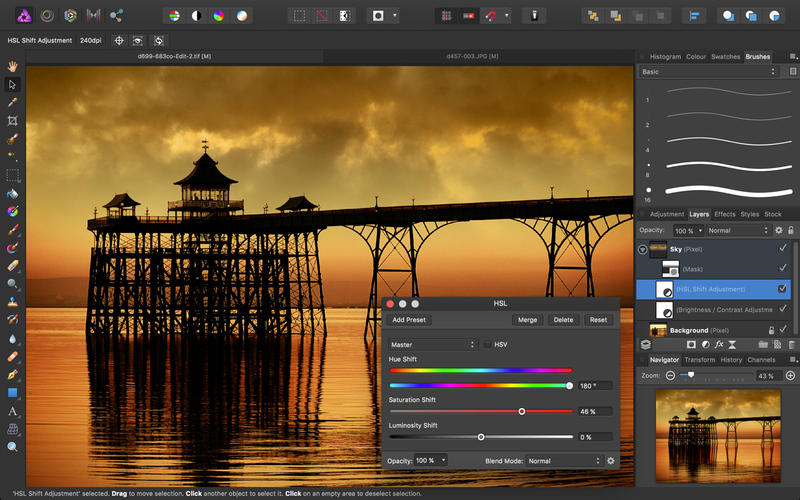 Photoshop, Elements and other other image-editors use adjustment layers too. So here I want to make the sky just a little darker with a Brightness Contrast adjustment, but it’s darkened both layers, not just the sky. 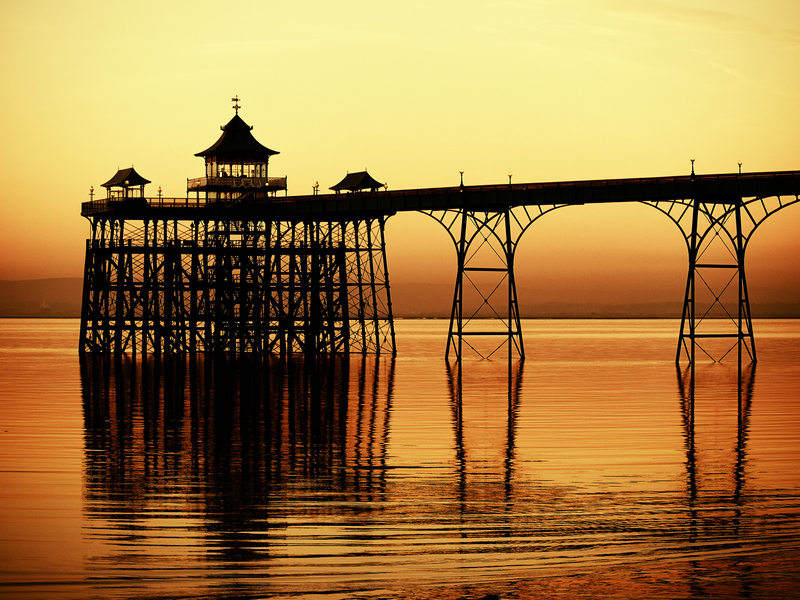 The fix is relatively easy – you just need to ‘clip’ or ‘group’ the adjustment with a specific layer, not the whole image. In Affinity Photo (and Photoshop) you do this by alt-dragging the adjustment layer onto the layer you want to clip it to, and that’s what I’m doing right here in the Layers panel. It’s probably a bit small to make out at this magnification, but if you click on this screenshot you’ll see a larger version which makes it clearer. You should be able to see a ‘ghosted’ version of the Brightness Contrast layer being dragged into position below the ‘sky’ layer. 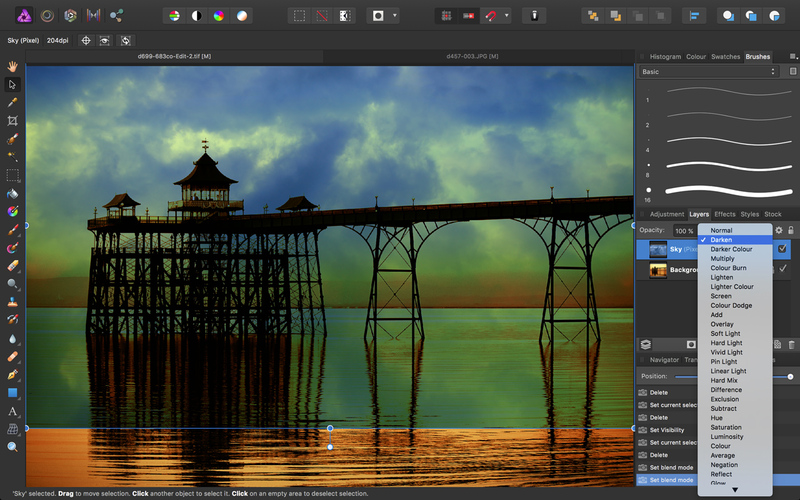 You can see from this screenshot that the Brightness Contrast adjustment layer is inset below the ‘sky’ layer to show that it’s being applied to this layer alone. That’s not the only adjustment I want to make, though, because I want my new sky to match the colours of the image below. For this I need another adjustment layer, this time for HSL (hue, saturation and lightness). By pushing the Hue slider way over to the right I’ve shifted the blue tones of the original sky towards the yellow/amber tones of the image below, and increasing the Saturation matches the intensity of the colours. I’m quite pleased with the finished picture because it’s kept the intense colours of the original but now has a much more interesting sky. And the two techniques I’ve used to blend in the sky – blend modes and a gradient mask – have (a) saved me from having to create a very complex and time-consuming selection and (b) produced a result which I think looks more natural than any regular selection technique. The fact that it was easy to do is a bonus! I’m learning to use Affinity for iPad Pro so this new for me tutorial using layers and masks was esp useful & fun – thanks, Rod!